It seems that the Chicagoland area has many good restaurant choices for GF dining. I recently travelled to Philadelphia, and the restaurants I visited there did not seem to be nearly as well-equipped to serve the GF person. I feel fortunate that there are so many good choices here. There are also more and more GF prepared foods and mixes. My favorite dishes would be those which are the GF equivalent of foods that I ate and liked before I became gluten free. For instance, if you liked Stouffer’s Turkey Tetrazzini, wouldn’t it be great if Stouffer’s had a GF alternative. I do appreciate the diversity of choices being offered, but wish there were more items that mimicked the non-GF dishes. 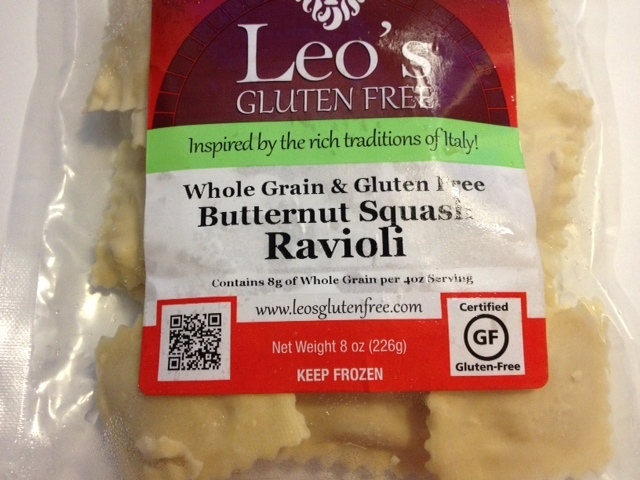 I was happy, recently, to come across Leo’s Butternut Squash Ravioli. It comes frozen and a few minutes in boiling water will prepare it for your meal. The package serves two. 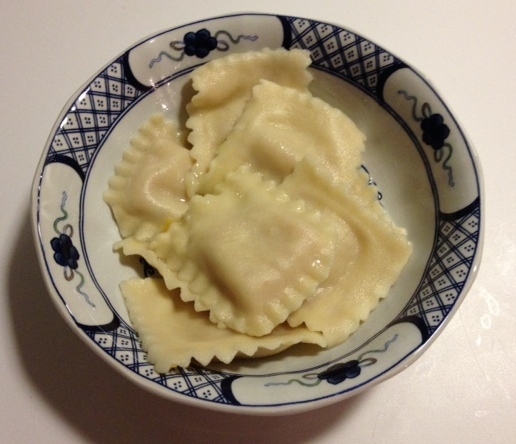 (I photographed the cooked ravioli with just a pat of melted butter, rather than a sauce, since I didn’t want to obscure the pasta.) It is quite satisfactory – good flavor, and the pasta doesn’t deteriorate while you are eating it. Leo’s has a number of other GF foods. I bought a package of mushroom ravioli, but haven’t prepared it yet. I found this at Mariano’s – the new one on Highway 22 and Quentin. It is a huge place – calling it a grocery store doesn’t tell the whole story. I’ll do another posting soon about all the great grocery stores that are within a 15- or 20-minute drive from our house. I do miss the convenience of the Dominick’s, especially the great pharmacy staff they had, but the food shopping is much better at a number of other locations.